Health insurance has become hazardous to your health with more questions than answers as the US fully moves into the unknown land of the Obamacare exchanges. Many Americans are still not aware of what they need to do as the deadline approaches to purchase health insurance or pay a tax penalty. If you are like most Americans, you are probably very confused as to what will happen once the March 31 deadline arrives, if you even know there is a deadline. 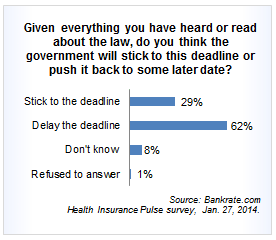 In a survey released Monday morning, Bankrate says that fewer than half (45 percent) of all respondents correctly identified the March 31 cutoff to purchase insurance under health reform’s “individual mandate” provision. And with all the changes and delays the Obama administration has announced related to the new health insurance system, 36 percent of people making less than $30,000 believe the March 31 deadline will also be moved. Sixty-six percent of those between the ages of 18 and 29 expect the deadline to change, compared with around 60 percent for other age groups. Even though the White House announced that enrollment in Obamacare has reached 3 million as February looms on the horizon, fewer than half the number needed by March 31 have signed up. Moreover, the young and healthy that Obamacare so desperately needs to make the program work are not joining in the numbers expected by the government. Gone are the days in which most employees would leave their health insurance up to their employers, only having to choose the details of the plan that best worked for their situation. Obamacare, for those required to purchase health insurance, is a major headache. Millions of Americans are losing employer provided insurance (which they liked), and they are being offered individual or family plans that cost more and provide less coverage than their old policy. According to USA Today, the majority of those signing up for health insurance plans at the troubled Healthcare.gov website are not the uninsured Americans that Obamacare was supposed to help. Instead, most of the policies are being issued to previously insured people who lost their coverage because of Obamacare’s onerous rules for renewing existing policies. Just last week, Target announced that it will not offer health insurance coverage for part-time employees any longer. Jonah Goldberg, from National Review Online, says the fact is that there are more uninsured people now than before Obamacare. “So what was the point of Obamacare again?” he asks. The latest polls show dwindling support for Obamacare with 59 percent of voters opposing the health care law, up from 55 percent who opposed it six months ago. The increase in opposition comes from both Independents and Democrats. But the Obama administration remains optimistic that things will get better with the improvements made to Healthcare.gov. “As our outreach efforts kick into even higher gear, we anticipate these numbers will continue to grow, particularly as we reach even more uninsured young adults so that they know that new options and new ways to help eligible individuals pay for their premium are now available, thanks to the Affordable Care Act,” the Centers for Medicaid and Medicare Services Administrator Marilyn Tavenner said in a statement. Nonetheless, detractors believe that if this new health insurance system fails, it won’t be because of Republicans threatening to get rid of it, but because of Americans refusing to sign up for something that costs more and offers less than their previous insurance. And of course, most Americans are not thrilled with the idea of being forced by the government to buy health insurance or pay a fine.